custom cabinet girl: we're trying to sell to the world! 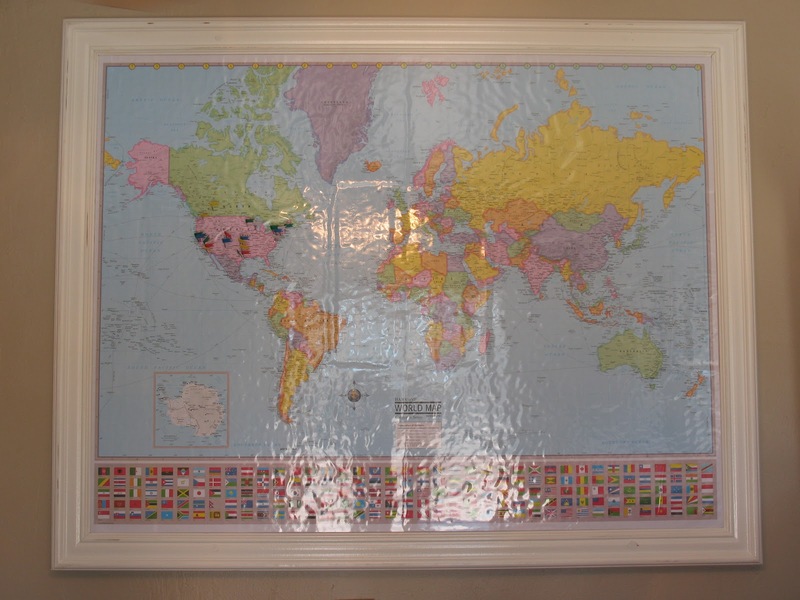 Well we decided to frame a map of the world hang it up in the office and flag all the cities of the Williams-Sonoma stores we are in. It seemed like a lot of stores and so far apart but when you flag it on a map of the world it begins to look small. Nevertheless its still exciting and I am so looking forward to adding more flags to the separate people I sell the blocks to "around the world." By the way, (and when I tell you this you are not going to believe it cause I hardly can), I will be on aoljobs.com in an article about my story by the end of the week! And.....if AOL decides to do so they will put it on their front page where millions of people will see it! Crazy and I cannot believe I am writing this right now. I am so excited I can hardly concentrate yet put together a sentence. I want to mention the journalist Lisa Johnson Mandell who called me and interviewed me and graciously decided to pitch this story. I am so grateful for the opportunity. Weber's Cabinets, Inc. and you too can have one of your very own! Later to all my wonderful blogging following peeps! Wow, so exciting! A few weeks ago Zack went into the WS in Friars Road, but wasn't able to find one and the staff wasn't able to find info in it in the computer. We'll have to try again- maybe we were too early! Yes I just found out a couple of days ago they rescheduled for September 1st. I forgot to post about it. I loved reading your story and am very happy for your success. I looked at your chopping board and while I love them and will probably buy one as is. I was wondering if you had thought about customizing some of the ones that you're selling on your website. In particular, it would be very easy to use the blocks to spell out initials or a monogram -- it would make a great gift for the cook in everyone's life. Hey April, Congratulations! If you read the story of the woman who created Spanx, she is not that different from you. When her first order was placed with a major store, she had all her friends go to that store throughout the country and buy any and all they had in stock. Demand is a wonderful thing! Good luck to you. I'll be looking for the cutting board. Great Christmas gift! What an excellent story! You GO GIRL! Thank God we all have these "brainstorms". What is it that Maxine says???? When life hands you lemons - make lemonade. Will keep an eye out for your cutting board. Would love to see you expand your product line, maybe a lazy susan or even a cheese tray. Congrats to you and your company. I just read an article about you and your cutting board. Good job. It's nice to see someone come up with a simple idea like that. Good luck in your new line of products. Making cutting boards are a lot more fun than making boxes. Hello! Congrats on your success! Your story is so inspiring. My blog is my passion and I love how your's has helped you help your family business. Thank God for the internet and the opportunities. I love the cutting board! Great idea. Congratulations! I saw your AOL Family Business story. I love hearing stores of women succeeding in business!